There is nothing more fun than crafting and pretending with Preschoolers, and hosting a "teddy bear clinic" is a wonderful way to spend an afternoon. 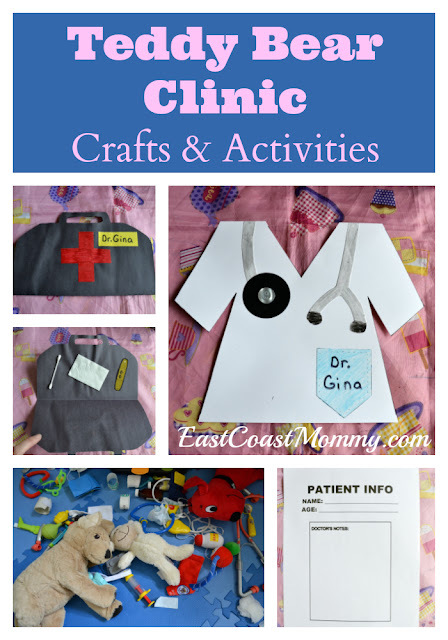 Recently, I had a "teddy bear clinic" theme for my weekly Preschool class, and today I am sharing the details of our Teddy Bear Clinic crafts and activities. 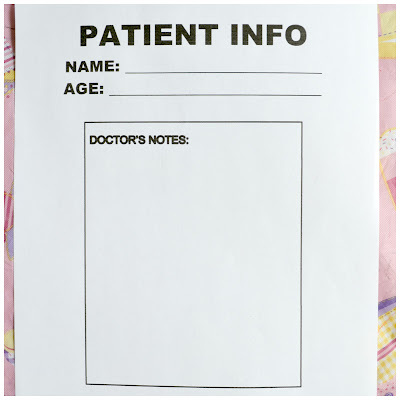 As the kids arrived with their stuffed animals / patients, we filled out a patient info form together. 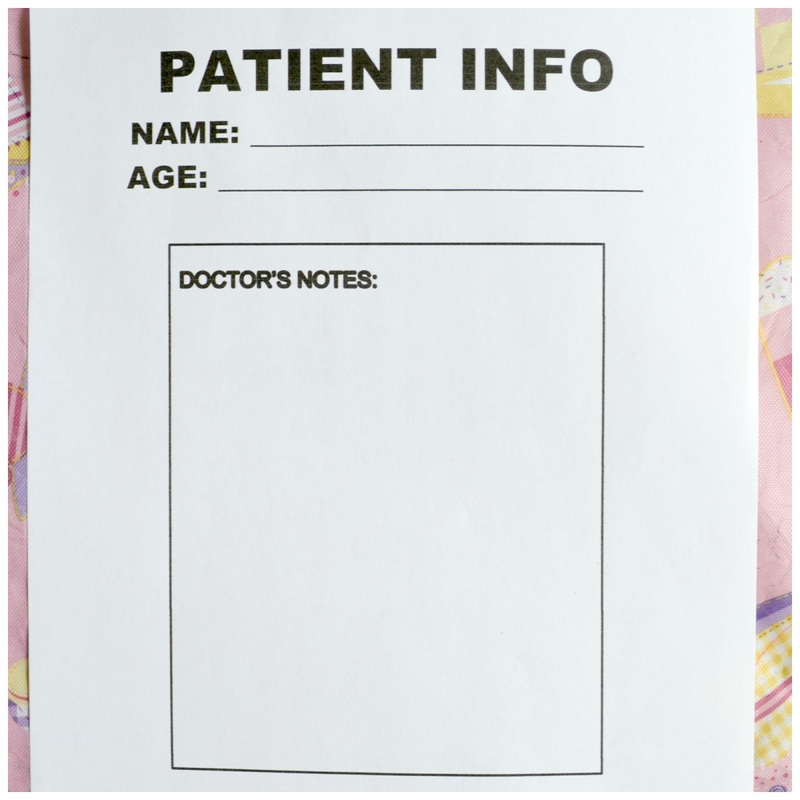 You can download the patient info worksheet here. 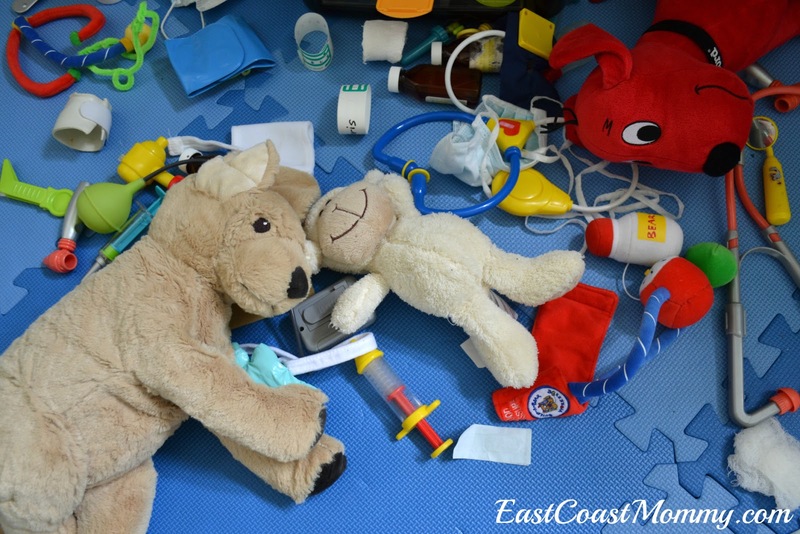 Then, the kids spent some time "examining" all of their stuffed animals/ patients. 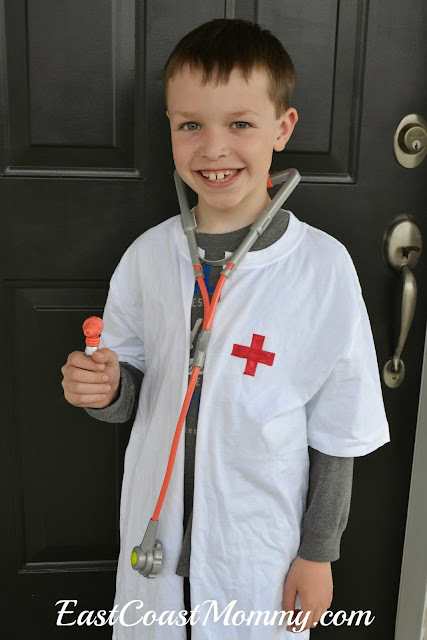 You can even make the kids pretend lab coats from old white t-shirts. No sewing required! After we were finished playing, the kids got started on some fun doctor crafts. Check out this adorable paper doctor's bag. 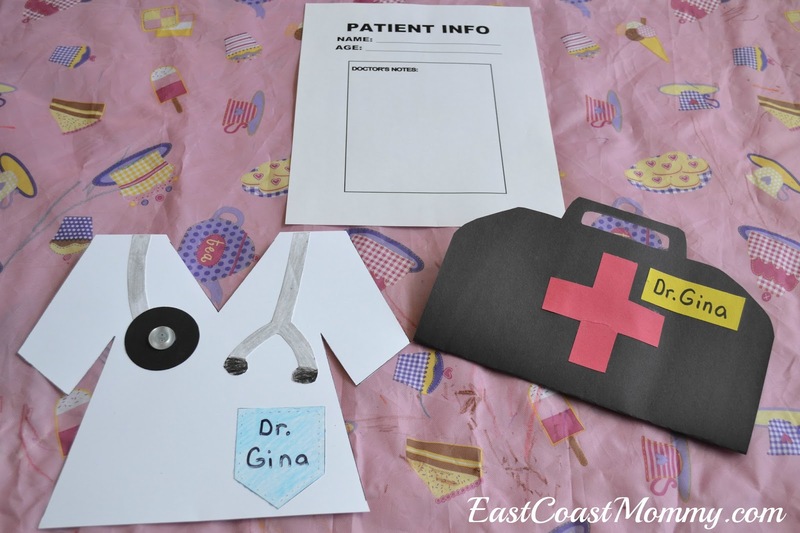 I cut out the bags from black construction paper, and the kids coloured the crosses, and glued all the medical supplies to the inside of the bag. 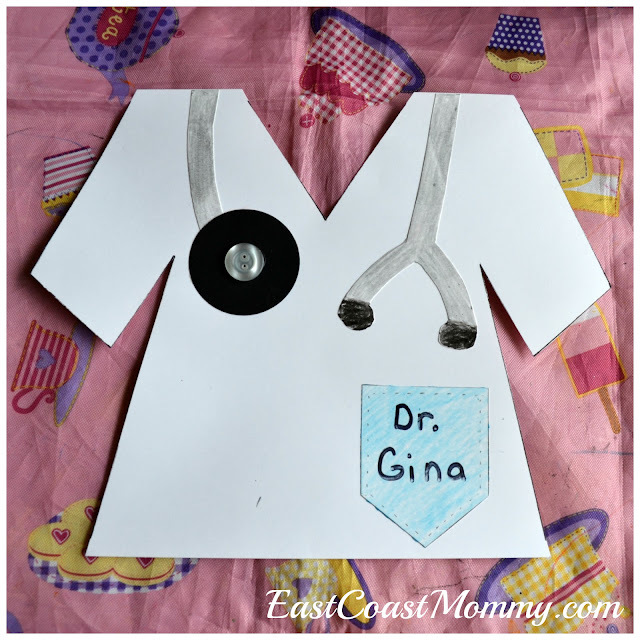 We also made a little doctor coat craft. The kids had fun gluing all the items to the white coat. Do you know a little one that would enjoy an afternoon playing "teddy bear clinic"? 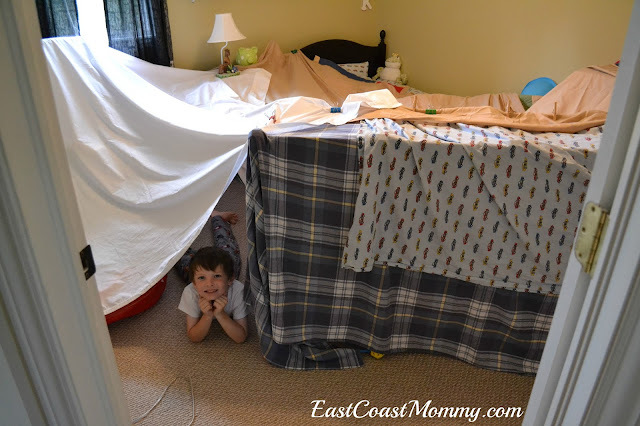 Or perhaps you have a preschool class that would have fun with this theme? These teddy bear clinic crafts and activities are easy to plan and do with Preschoolers. 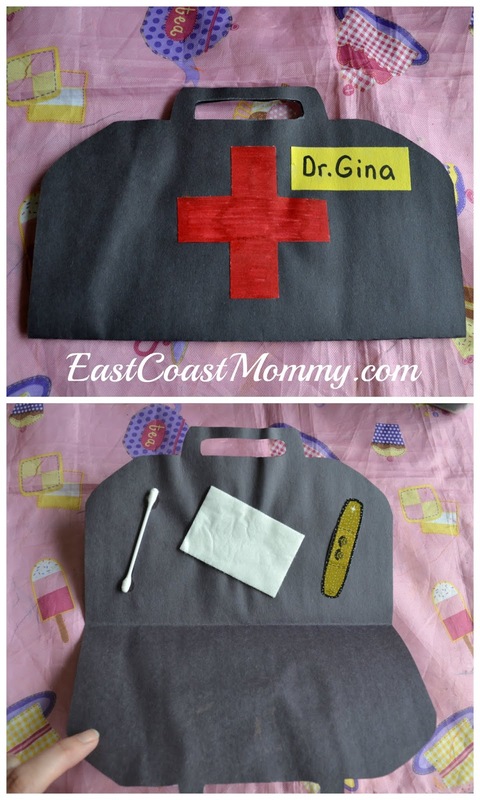 I love the doctor bag, but it's all super-cute, don't you think? 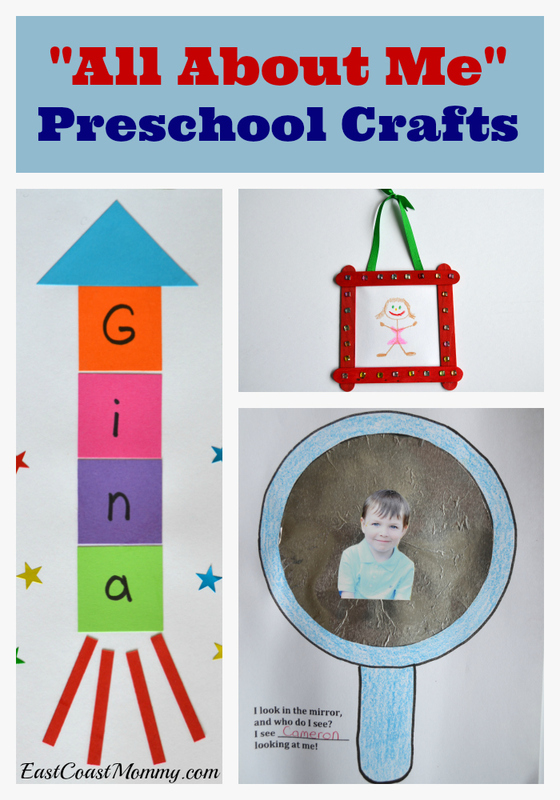 Crafting with Preschoolers is a lot of fun... especially when the crafts centre around a fun theme. I love the idea of spending an afternoon making music crafts with little ones. 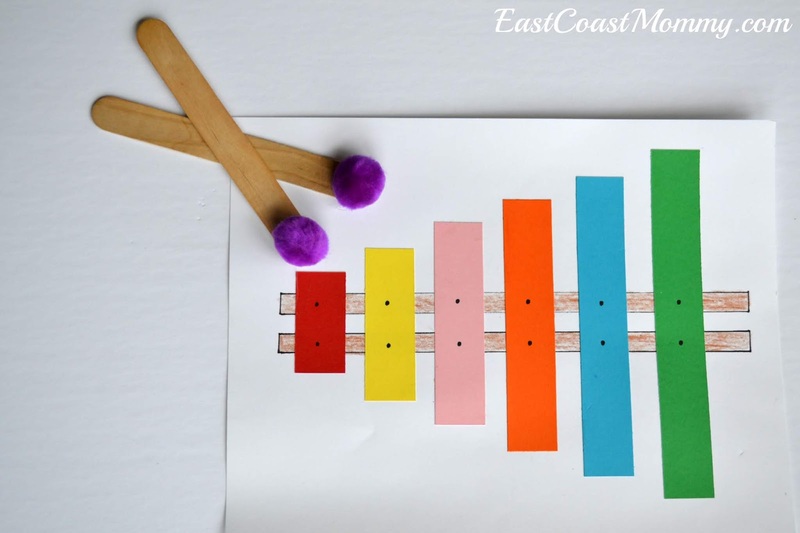 So, today I am sharing three of my favourite music crafts to make with Preschoolers. 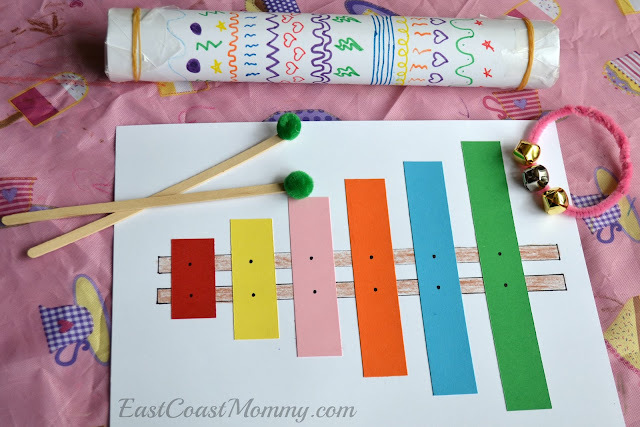 I love this xylophone craft, and it is a super-easy paper craft. 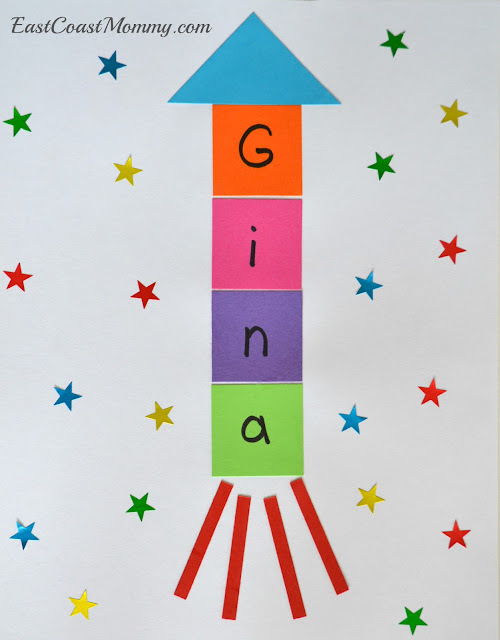 Using different colours and sizes of paper, kids can easily use glue and scissors to make this fun craft. Just add some pom poms to a couple of craft sticks, and kids will love "pretending" to play this colourful musical instrument. Jingle bells are another simple crafting option. Kids can practice their fine motor skills by stringing bells onto an pipe cleaner and then turning it into a "jingle bracelet". 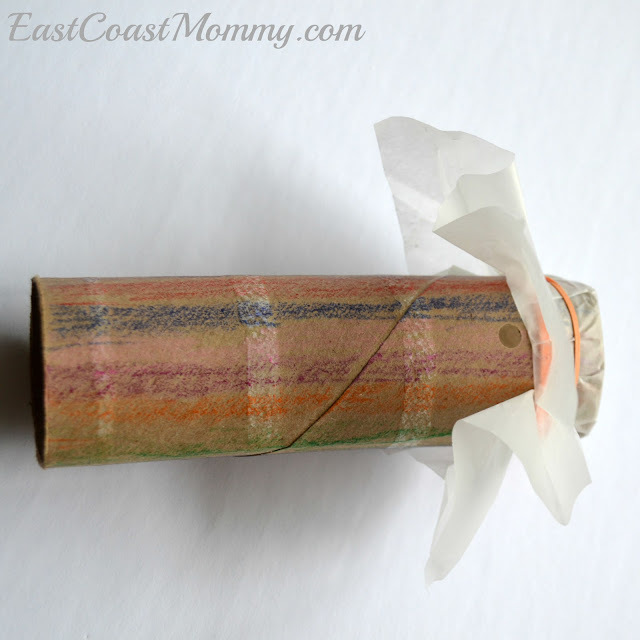 And who doesn't love a good paper towel roll craft? Creating a kazoo from a paper towel roll couldn't be easier. Colour a paper towel roll, use a hole punch to make a hole near the top, attach a piece of wax paper to the top, and secure it with an elastic. 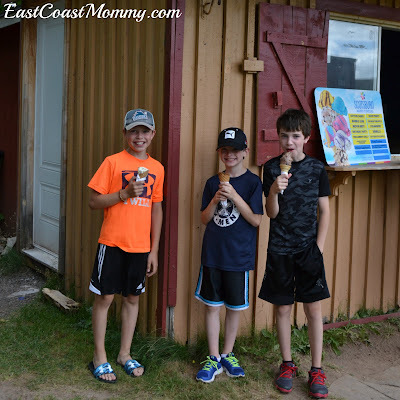 The kids can make a fun kazoo sound by humming into it. It takes some practice, but it is a lot of fun! You can also make rain stick from a paper towel role by twisting up a piece of tin foil, placing the tin foil inside the roll, and sealing both ends with wax paper and elastics. 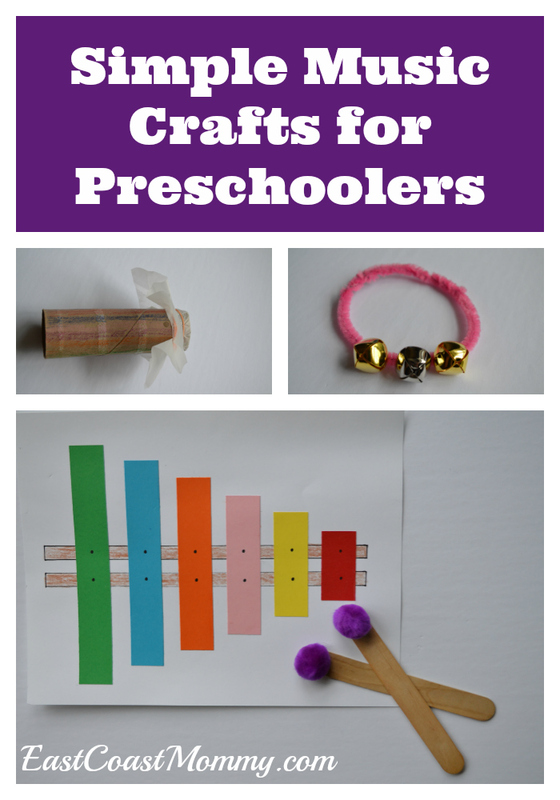 Do you like crafting with preschoolers? Music crafts are fantastic, and you can always end the day with a good dance party... and who doesn't love a good dance party? My boys' baby books did not get filled out (due to the fact that I had three boys in three and a half years), so when they were little, I started writing letters to them on their birthdays. My hope is that the letters will capture the unique things about their personalities that I never want to forget. Today, I am sharing the birthday letter I wrote for my middle son on his 11th birthday. You are friends with everyone. (You get invited to more birthday parties than anyone I have ever met.) People love to be around you, and you love to surround yourself with people. You have a smile that lights up your face, and you always have a twinkle in your eye. I think it's my favourite thing about you. You love to be moving. You enjoy hockey, golf, softball, tag, man-tracker, riding your bike, and more! You love playing hockey with your team, and you love playing street hockey with your brothers. Listening to music is one of your favourite things to do. You make great playlists, and you know the words to a lot of songs. You are really smart, and you enjoy figuring things out and building things. You love LEGO. You can be very stubborn, and when you set your mind to something, it is not easy to change it... but although it can drive me crazy, it is a quality that I know will serve you well in life. I love you (and your sweet smile and perfect hugs) more than I can express in words. I teach a weekly preschool craft class, and each week we make crafts related to a different theme. 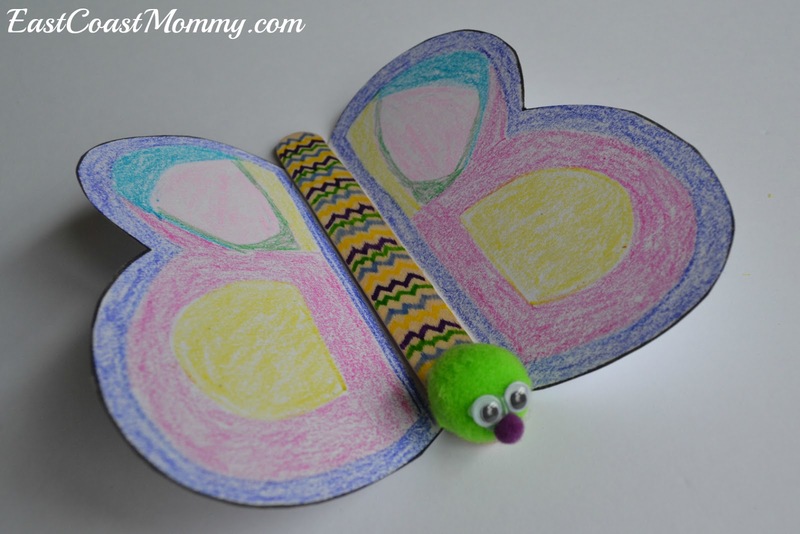 Today, I am sharing some wonderful crafts related to the theme: "All About Me". Everyone wants to feel like they are the centre of attention sometimes, right? That's why this is such a great theme for Preschoolers. Isn't this name rocket cute? The child can glue on all the pieces and add star stickers to create a starry night. It would look great on a black piece of paper too. 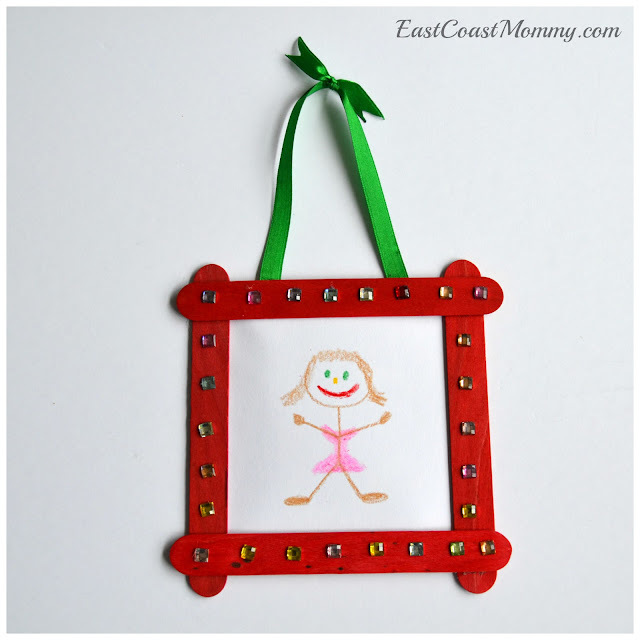 And this self portrait with a popsicle stick frame is adorable! A grown up can help the child put the frame together, and then the child can draw a picture and decorate the frame with jewel stickers. This mirror craft is also great. 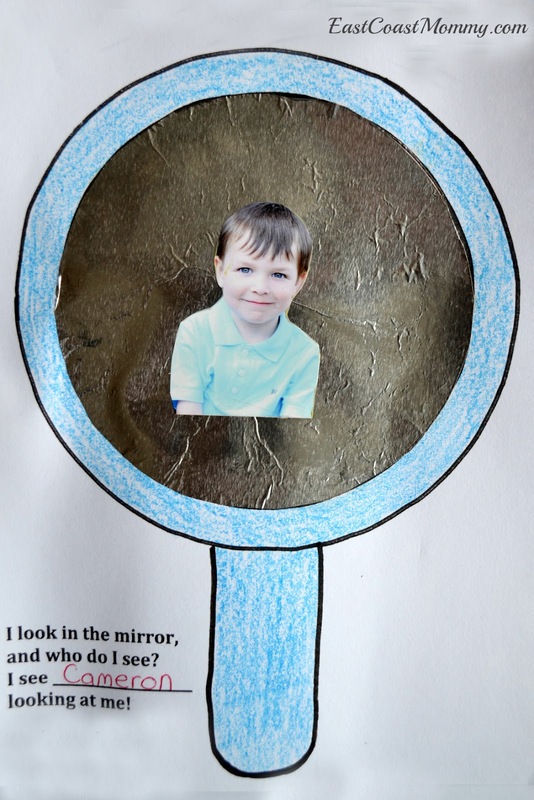 Have the child colour the mirror, glue on a tin foil centre, and glue on his/her picture. Cute, right? And, when you are done crafting, "show and tell" is the perfect activity to do with the kids. Getting kids to share info about themselves is wonderful for their self esteem, and because of this, "All About Me" is a great preschool theme. Crafting around themes is always fun for preschoolers, and I love making crafts that become things to play with too. 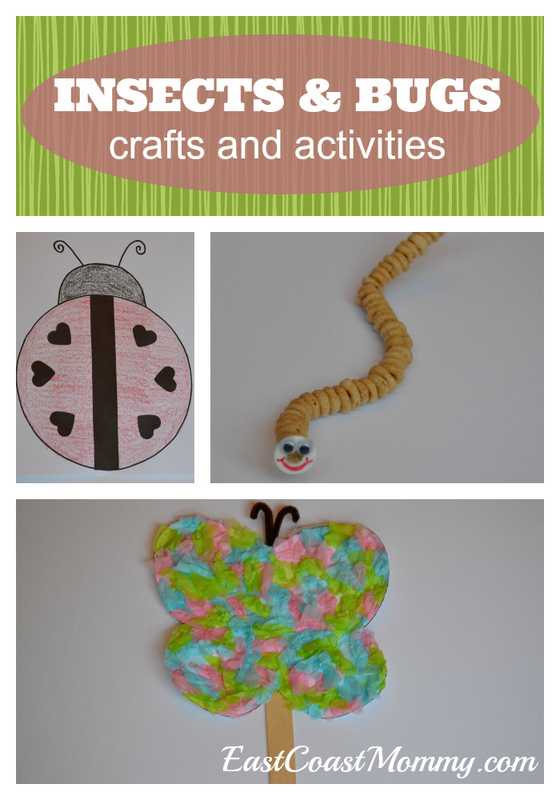 Today, I am sharing some of my favourite insect and bug crafts for Preschoolers. Check out these three cute crafts. You could make a paper lady bug with heart shaped dots. You could also string a button and a bunch of Cheerios onto a pipe cleaner to make a little worm. 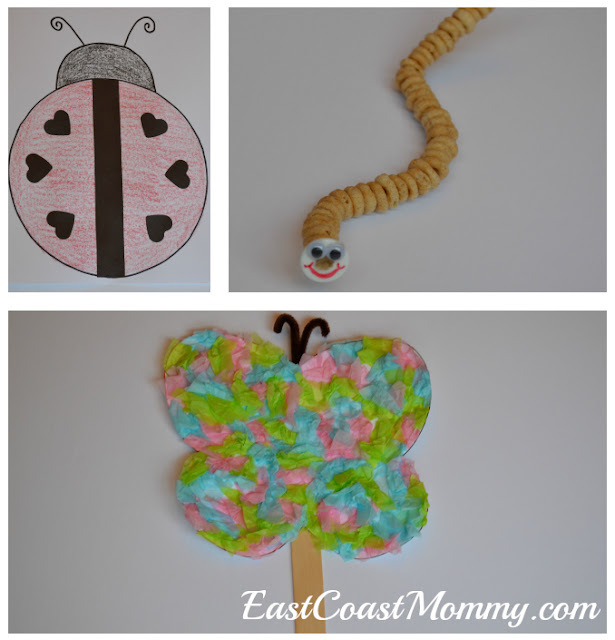 Or you could make a colourful butterfly puppet with some paper taped to a craft stick and covered with scrunched up squares of tissue paper. I like this butterfly too. The craft stick glued to the top allows the wings of the butterfly to be bent so it looks like it is flying. Cute, right? 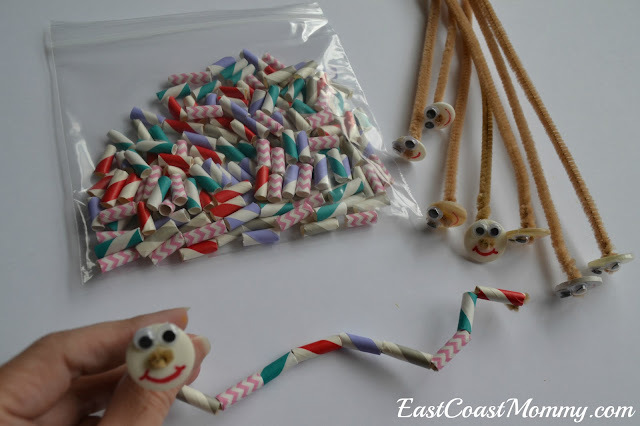 And finally, how adorable is this little snake made from paper straw beads? Kids can practice scissors skills cutting up beads, and then they can practice their fine motor skills stringing the beads onto a piece of pipe cleaner. A button head at the end of the pipe cleaner will allow the kids to string the beads without having them fall off. Don't you just love these insect and bug themed crafts for Preschoolers? I especially love the little paper straw bead snake. 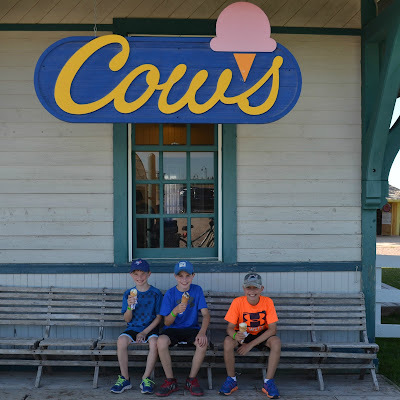 Every year, I write "birthday letters" to my boys on their special days. My hope is to compile the letters together and give them a book on their 18th birthdays. Today, my "baby" boy turns 9. 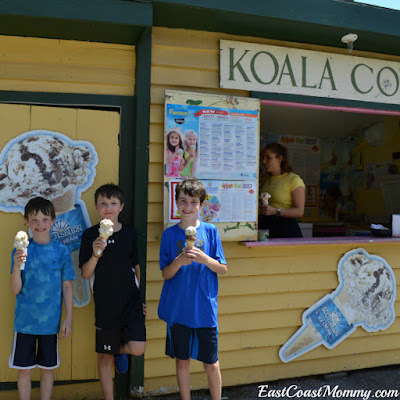 Time is going by much too quickly, but I am holding on tight and enjoying the adventure. 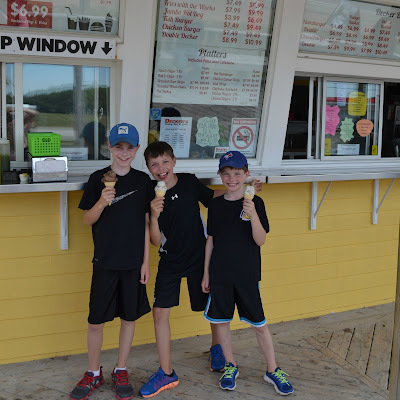 Here is my birthday letter to my sweet third born son on his 9th birthday. You ask the best questions. You have a unique way of looking at the world, you have a wonderful sense of curiosity, and you are constantly quietly observing everything around you. You are funny. You are always making us laugh with your silly ways and crazy dance moves. 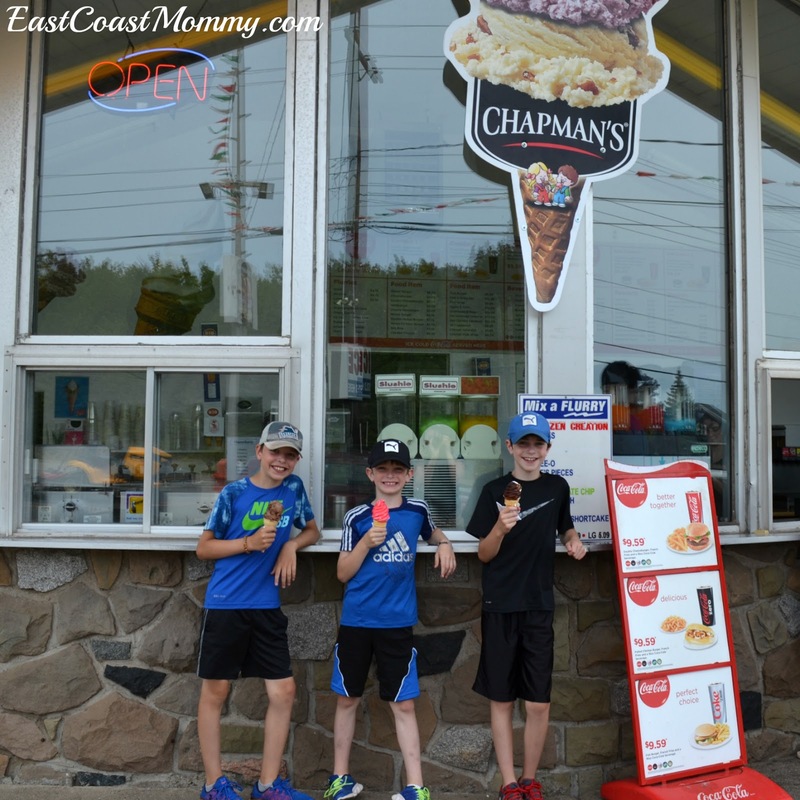 You love playing ice hockey with your team and playing street hockey with your brothers. 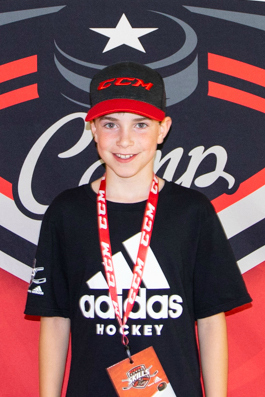 Your street hockey goalie gear is one of your prized possessions. 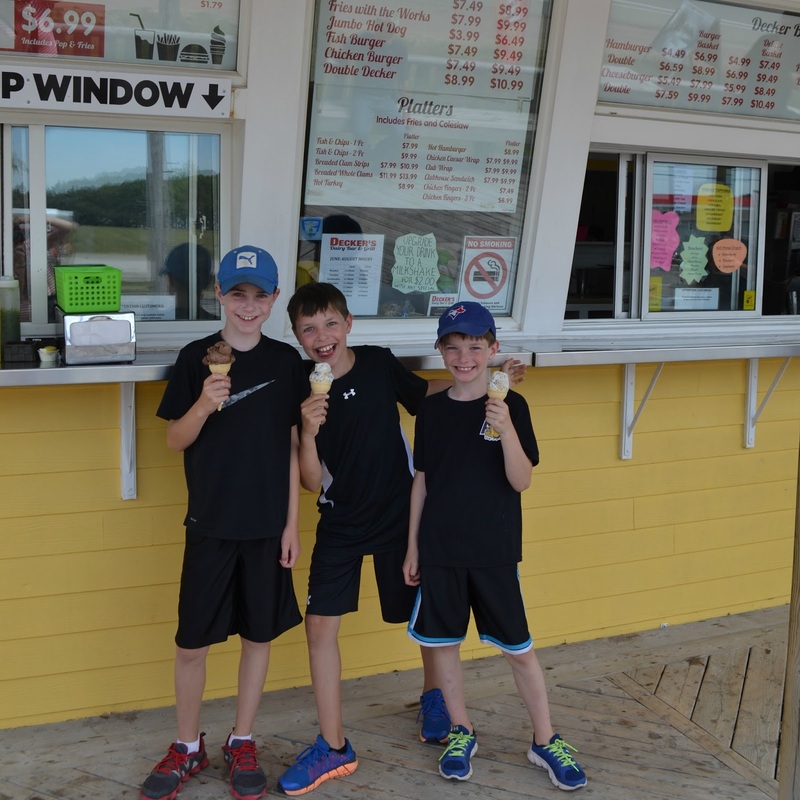 You love being outside with your brothers playing softball, tag, golf, man-tracker, and soccer. You also love riding your bike. You love your big blanket, soft songs and being read to in a soft voice. You get cranky when you are over-tired or anxious... but you have a kind heart and give great cuddles. I love you to the moon and back my sweet boy, and I hope your 9th year is the best one yet! 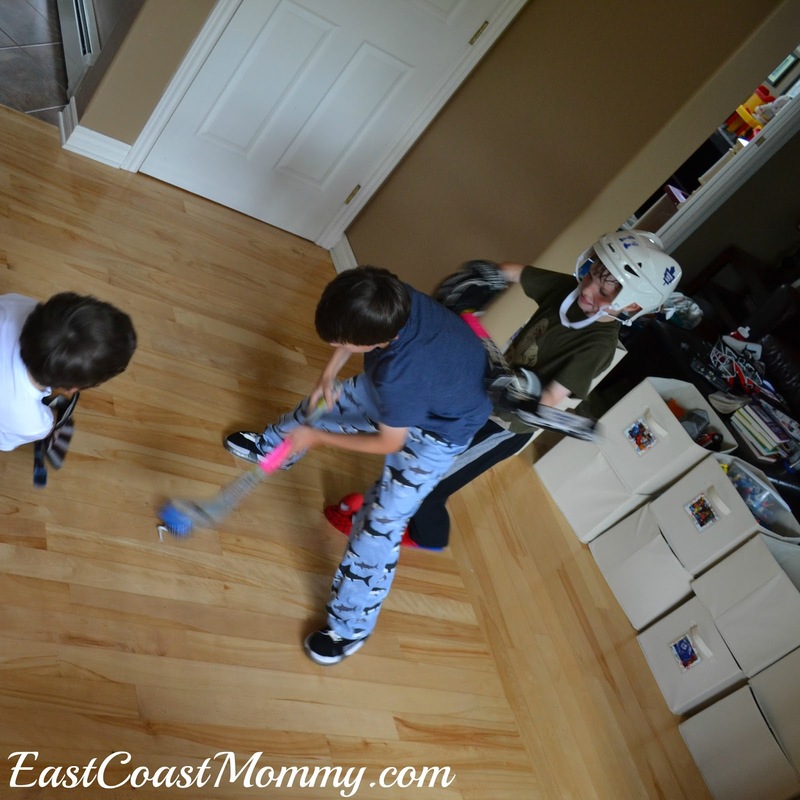 Play hockey in the kitchen (with "boards" they make with all their toy bins). 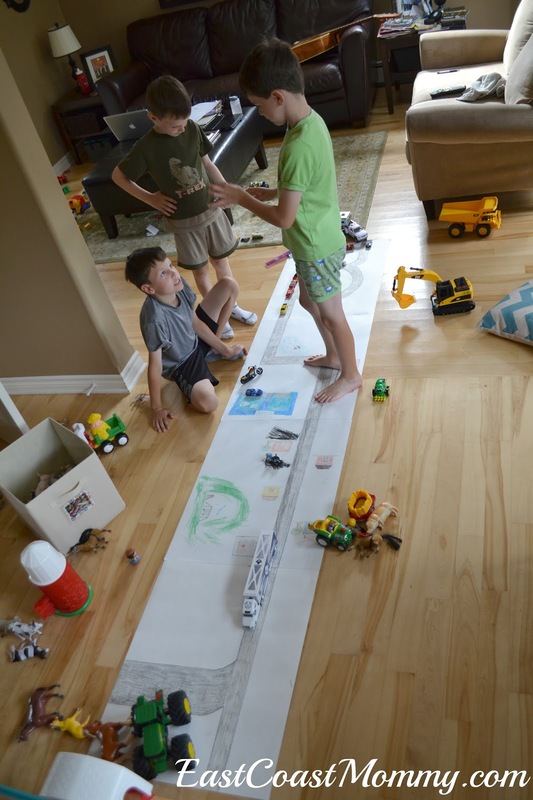 Build a road from a roll of paper, and let the kids take out all their cars and trucks. Or have a huge water fight in the yard. Today, embrace the laughter, joy and mess. Tomorrow, you can clean the house. 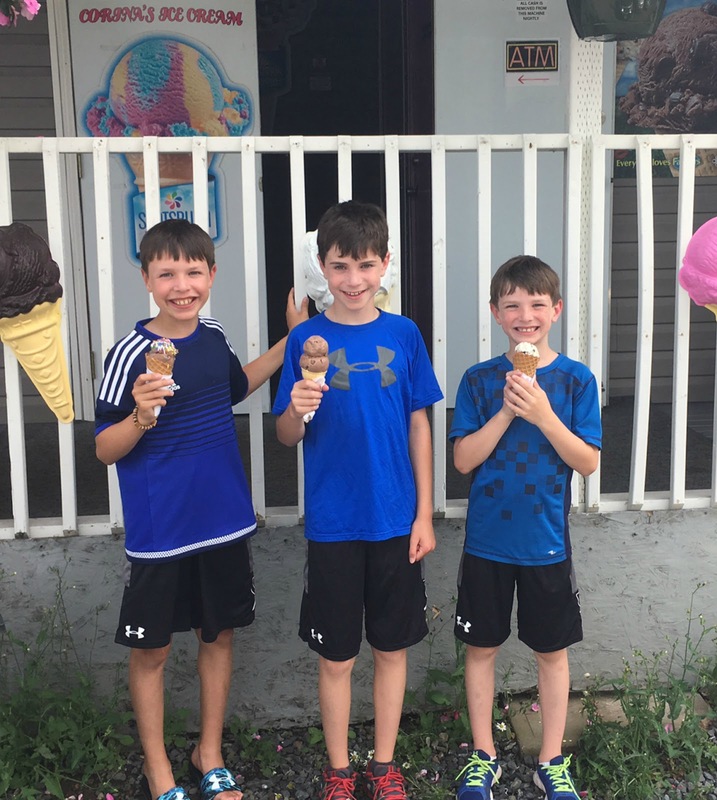 Childhood passes much too quickly. Recently, my boys were given the opportunity to try out (and review) some fantastic games from GONGSHOW*. All three of my boys are passionate about hockey, so during our summer break from the rink, they were excited to try out a couple of fun outdoor hockey games. 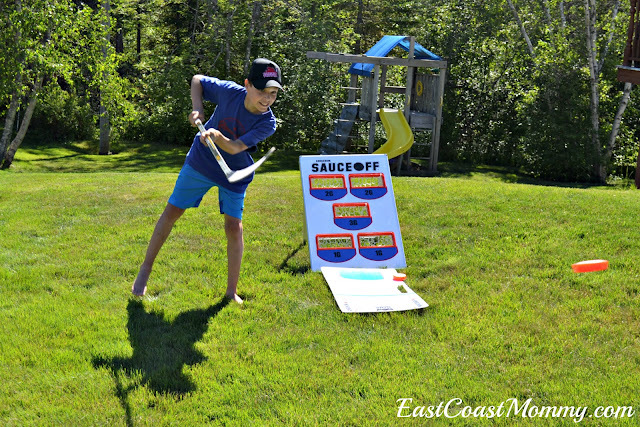 You can read our review of the SAUCEOFF Party Set below. 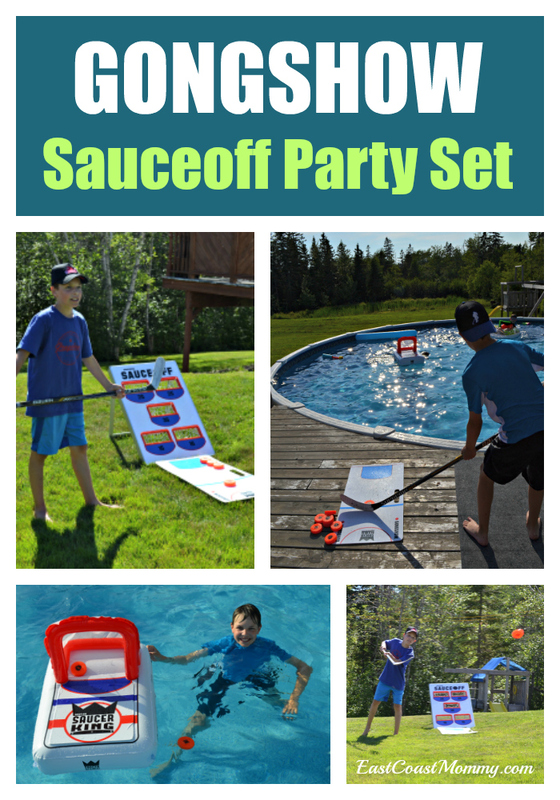 The Sauceoff Party Set comes with two games (which you can also buy separately). They both fit in a canvas bag that can easily be taken to the beach, backyard, tailgate party, campground, or cottage. 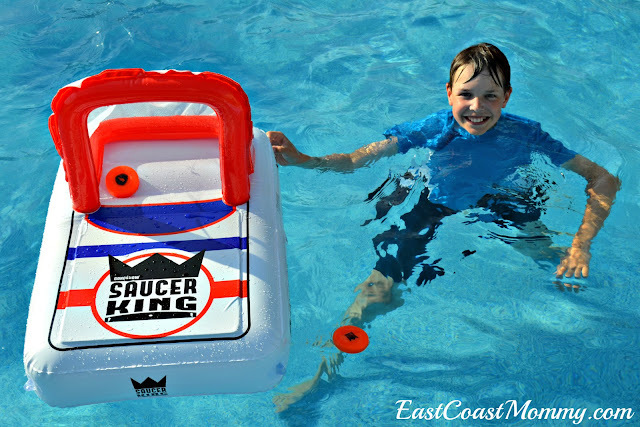 The first game we tried was the inflatable Saucer King Kit. This game includes a blow up net and floating pucks. (Two shooting pads are included with the party set, but if you are only purchasing the inflatable Saucer King Kit, you'll need to purchase a shooting pad if you don't already have one.) 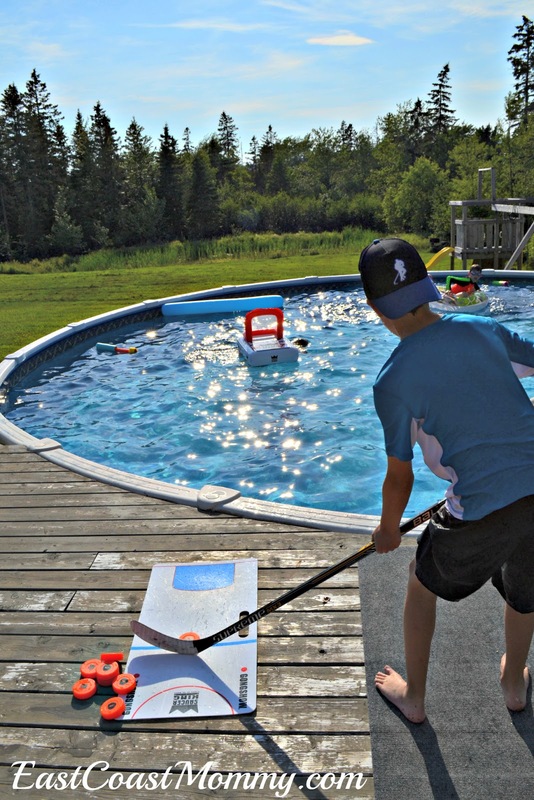 My boys had a lot fun with this game in the pool, and they are looking forward to taking it to the beach soon. 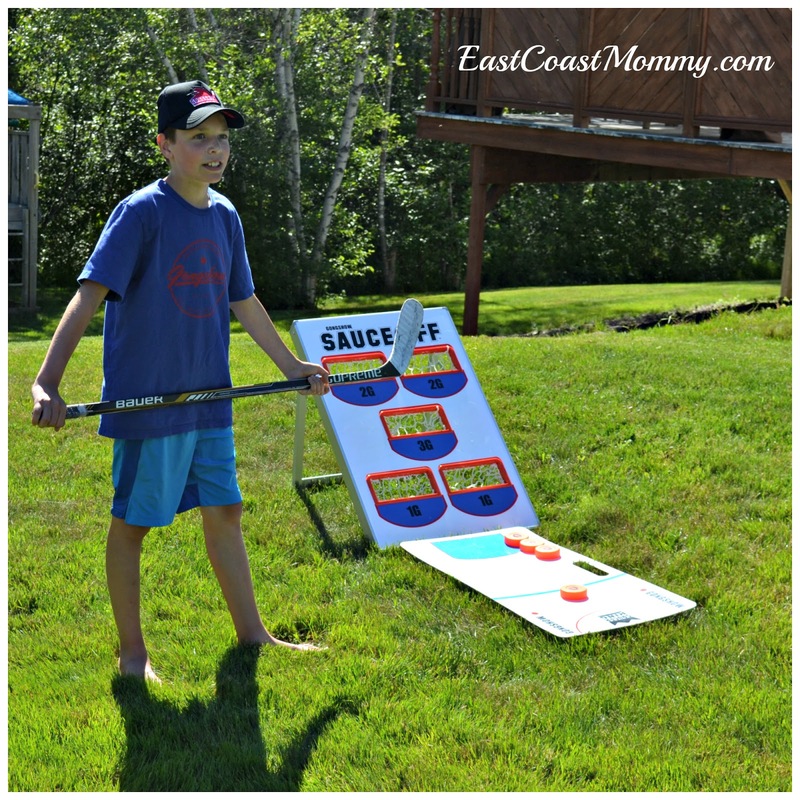 My boys also tried the SAUCEOFF game set. At first glance, it looks like a bean bag toss, but it is so much more than that. 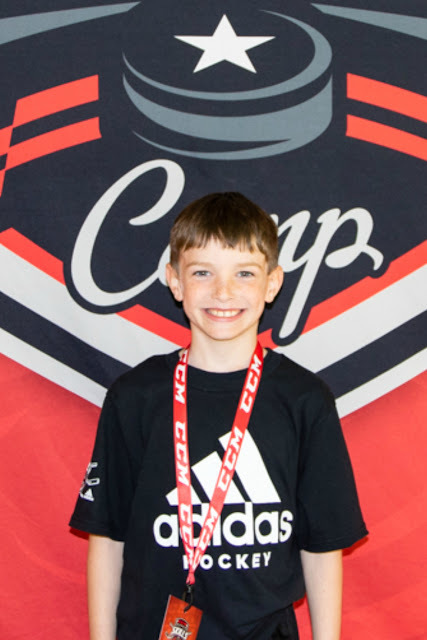 The game comes with two game boards, two mini shooting pads, 8 GONGSHOW floater pucks (4 per team), 4 bean bag pucks, 1 canvas carrying case, 1 replacement mesh and rope, and a booklet explaining how to play the game. 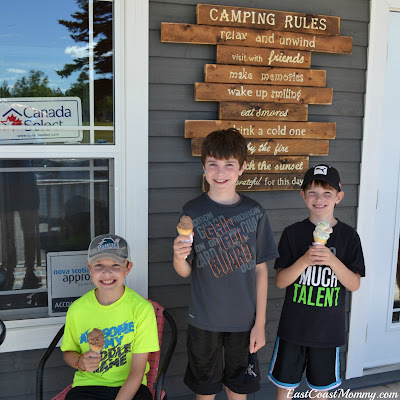 My boys (and my husband) have been playing this game in the backyard, but it is highly portable, so I know we will be taking it to the beach, the cottage, and camping. It's perfect for all ages. 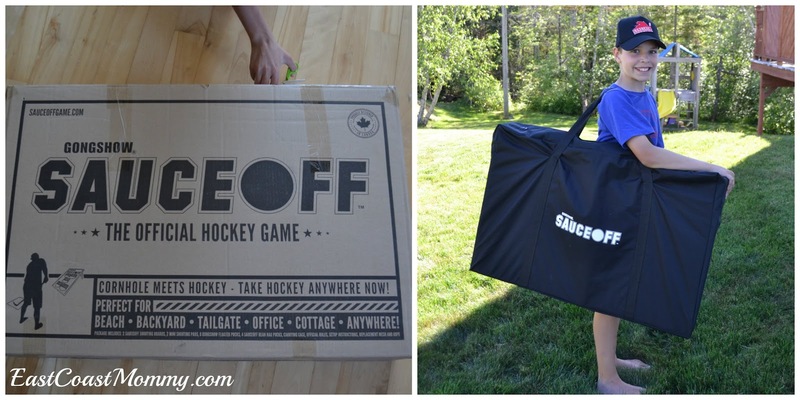 If you have a hockey-lover in your house, I highly recommend these fun games. The SAUCEOFF party set comes with everything you need to play both games, and if you have never purchased from GONGSHOW before, you can save 10% with this link: SAVE 10%. Have you tried either of these games? What did you think? 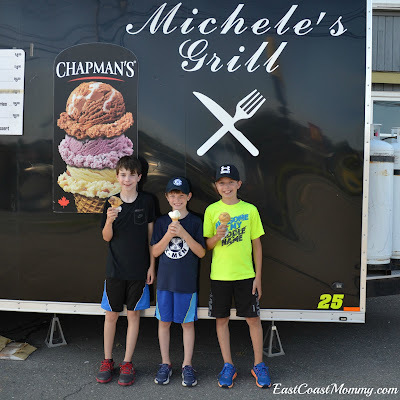 My boys are definitely fans! *Disclosure - I was given the GONGSHOW Sauceoff Party Set for free in exchange for my honest review of the product. 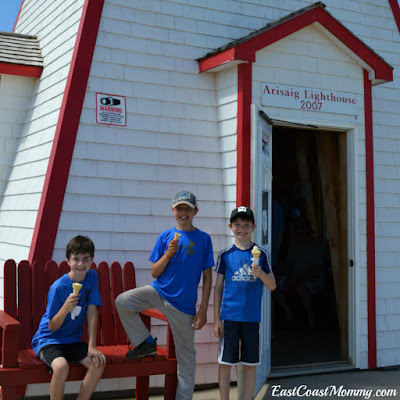 As always, the views expressed on this blog are 100% my own... and my boys genuinely love these games. Sometimes the most meaningful family memories come from the simplest ideas. 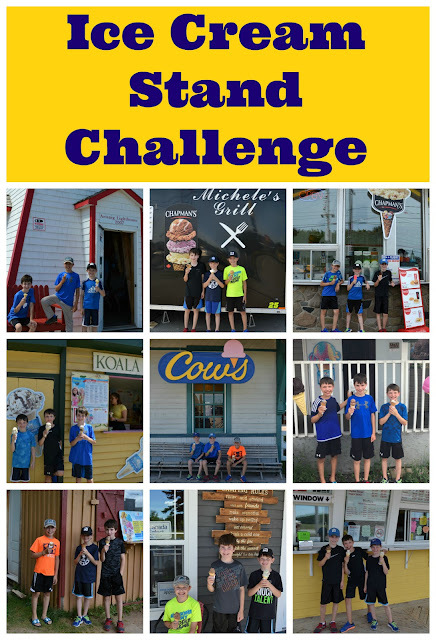 Last summer, the boys and I decided to challenge ourselves to visit 5 different ice cream stands. It was so much fun that we ended up visiting 9, and today I am sharing some of our ice cream stand challenge with you. 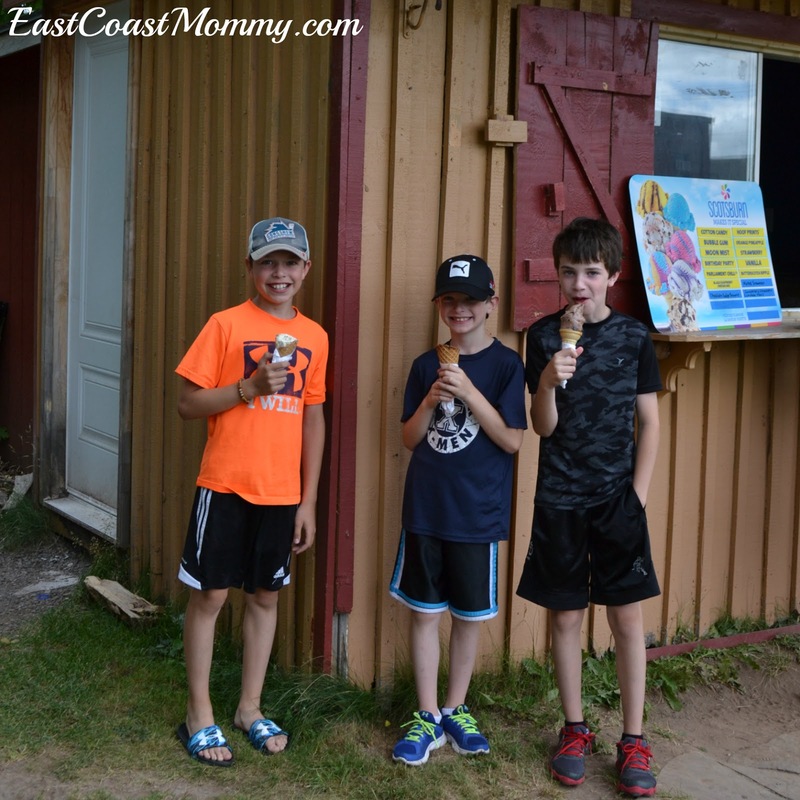 We had a wonderful time trying new ice cream flavours on hot summer days. 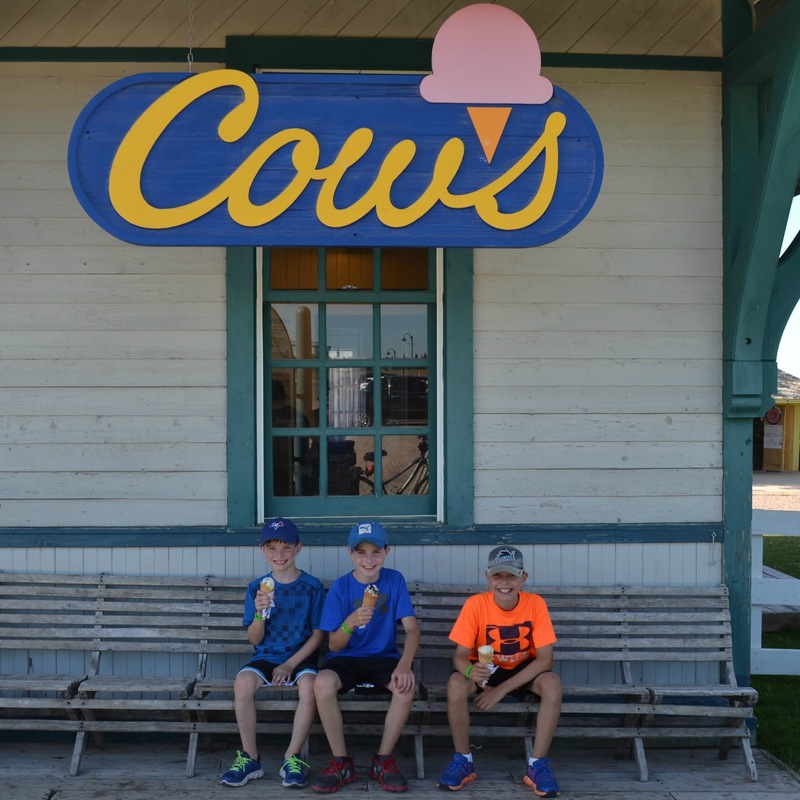 This year we plan on beating our record and visiting TEN ice cream stands. Anyone have a recommendation for us?? ?